Mr Behrens response to PACAC – fact check. When Rob Behrens took over as the new Ombudsman in April 2017 it was very much hoped that he would instigate a more open and transparent regime at the PHSO. Sadly this has not yet proved to be the case. Let us unravel some of the spin and obfuscation in his recent letter to Bernard Jenkin, published on 23rd January 2017 on the PACAC website. Financial compensation paid in 2016-17. PHSO made 13 payments to complainants in 2016-17, totalling £26,333. This included a single payment made to a complainant’s solicitors to reimburse legal fees they had incurred of £24,855 in relation to one of our investigations. The remaining 12 payments, therefore, totalled £1,478 and were relatively small consolatory payments to complainants ranging between £50 and £228. This recent FOI request from PHSO fails to mention the significantly large sum of £24,855 which must indicate a major failure on the part of PHSO. In other respects, Mr Behrens estimate matches up with the data previously released, although the smallest payment was £11.00 and not £50.00 as he claims. 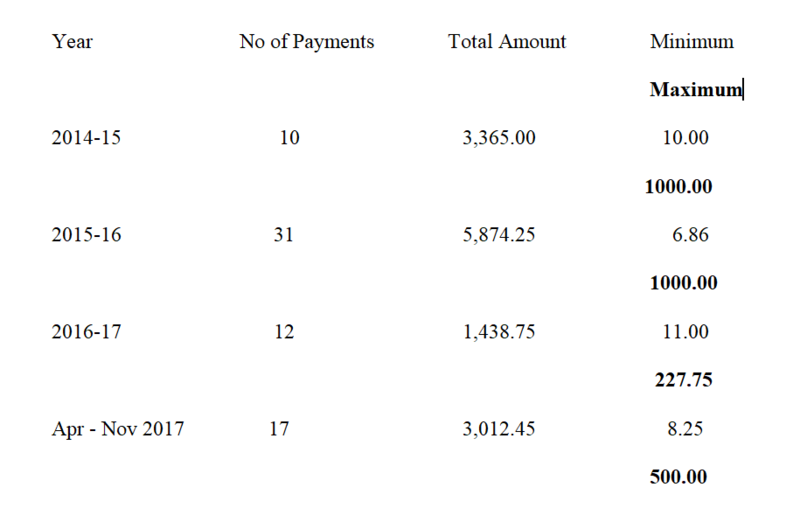 To put these payments in context it would have been far more helpful to list the payments made over a range of years. As can be seen below, 2016-17 was unusual for the relatively small sums of compensation paid out to mistreated complainants apart from the one major payment. It is interesting to note that the one significant payment clearly had legal backing. Delays in dealing with feedback from complainants. In fact, the annual report appears to show that the number of reviews has indeed declined from 392 in 2014-15 to just 81 in 2016-17 so how does this explain the increasing delays in dealing with feedback? Missing from this table, as it is every year, is the total number of review requests which is a very different figure to the total number of reviews. PHSO decide in-house whether a review request merits an actual review and as the number of requests rises (due to poor performance) so the number of reviews decreases giving a false impression of the quality of decision making at PHSO. The real question Mr Jenkin should be asking is ‘how many review requests did PHSO receive this year and why is that figure omitted from the annual report? This FOI request from September 2017 gives the detail. (The discrepancies in the figures is due to a discrepancy in response from PHSO). In 2016 – 17 there were actually 383 more review requests for decisions with the total of decision reviews at 2,352. Even more people dissatisfied yet PHSO reviewed only 81 (3.4%) and upheld 15 (0.6%). Without putting the total number of review requests in the Annual Report they then try to use the lower figure to argue that their service has improved at all levels when the data show the absolute opposite. More dissatisfaction. If review requests are considered to be a sign of dissatisfaction then it can be seen that this has increased at a near 20% rate which should be alarming. Mr Behrens neglects to mention that of the 15 upheld reviews only 5 led to a changed decision which is about 1 in every 500 requests. The situation in 2015-16 was even worse when only 2 out 1969 review requests led to a change of decision. This is shameful and more appropriate for an authoritarian state than for a liberal democracy. Is there any other judicial or quasi-judicial body that has such a low rate of successful appeal or review? It shouldn’t be surprising though when reviews are carried out by the same body that made the original decision, in secret and without external audit. This is not an acceptable state of affairs and it will have to change. The only question is how long it will take and which officials and MPs will be seen by history as the champions of justice for speaking out. Mr Behrens also claims that “our caseworkers do also regularly receive positive feedback directly from complainants about their work, even where we have not upheld a complaint”. The Customer Care Team, who consist of just 15 members of staff, are clearly run off their feet finding ways to turn down review requests, no wonder they don’t get many compliments. So nothing at all to do with the really important information about the investigation, just basic things that should be taken for granted. So again, nothing at all to do with the most important part of the complaint, the quality of the investigation. Only 44% agreed that “We will gather all the information we need, including from you and the organisation you have complained about before we make our decision” This is down 8% from the previous quarter. Only 50% agreed that “We will explain our decision and recommendations, and how we reached them”. This is down 9% from the previous quarter. So when it comes to the actual investigation, the most important part of the complaint, the statistics are not looking so good. But what about one of the most important statements regarding the quality of investigations. The statement of impartiality. How do complainants view this statement? Well, strangely enough, no figure has ever been published for the number of complainants who agreed with this statement. Why not? Perhaps it such a small number that it is too embarrassing to publish? In the Complainant_feedback_survey_2015-16 only 35% thought the decision “followed an independent, fair, and unbiased assessment”. Perhaps that’s why they stopped asking the public that particular question. Bear in mind that with all the Service Charter data just 24% of people who had a complaint investigated were contacted for feedback and 3% of people who had their case dismissed. (p13 Annual Report). Think how different these figures would be if everyone had automatic access to feedback their opinion of PHSO. Mr Behrens reiterates his claim that “there should not be a permanent body that routinely and independently reviews our decisions”, and claims that “the purpose of the Ombudsman is to be the independent complaint handler of last resort”. This would be fine if the PHSO delivered a high-quality service. It doesn’t and the statistics show that it doesn’t. Absolutely stunning blog post Della. Very sharp and very revealing. Needs to be Tweeted and shared all over FB and other social media. Maybe Tweeted direct to Bernard Jenkin. PHSO are absolutely devious and underhand. Does Behrens really think people are fooled? How must it feel to be so arrogant and superior, to know you are getting paid out of the public purse for this fiasco and lying to people for the money. Shameful behaviour and there’s a special place in the lake of fire for all who collude in this circus. Interestingly, Mr Behrens also doesn’t mention that the automated response for the Customer Care team was completely wrong for at least the last 7 months . It gave an assignment time of 6 weeks and a response time of a further 4 weeks. I advised them that this was wrong via a freedom of information request and asked what steps the PHSO were taking to put it right and was told that they were taking steps. (Yeah, I know, incisive investigation of the standard we expect from the PHSO!) Seven weeks and pressure from me and they altered the message and are, allegedly contacting people to explain the situation. This has been recorded as a breach of their Service Standards (whopeee, I feel so much better for that – not!) It was my FOI request that was quoted at the Select Committee Hearing. Update. I’m now waiting for Mr Behrens to write to me personally. I think I’m supposed to be flattered and believe that they’ll make real change. CCT = 1 YEAR and RB= 7months Expect I’ll need to write again! I suppose it’d be very naughty of us to compare notes on the answers we get? Mine’s promised next week but the Head of Customer Care isn’t in the office so someone else is meant to be giving me a contact point if I’ve got any concerns in the mean time. I think I’m pleased because I’ve only been with the CCT for ten months but I haven’t enjoyed the experience any more than I expect you have. From my own experience it is clear that there are far too many people in the NHS particularly in administration who are desperate to cover up for each others errors. In that respect the staff in the PHSO do exactly the same thing.. I am currently pursuing three G.P.s for clinical neglect and incompetence and they have invited me to report them to the PHSO., I have already advised them that I consider that to be a waste of time and am now planning to take them to court, with reports to the GMC as well. The PHSO from the outset make it clear that they do not normally offer or propose compensation, and if compensation is required they will not consider a complaint if legal proceedings have been started. T o my mind the PHSO, therefore is a complete and utter waste of time and tax payers money no matter how well intention the Boss is. Wise man! Have suffered Delay, Deny and Defend since 2009 and can categorically say All 3 Ombudsmen I have experienced DO NOT provide the support we pay handsomely for. Believe it costs us in excess of £32M per annum …..,..WHAT FOR? Will they ever learn the the truth may hurt but lies hurt more. My complaint about customer service was made in writing in 2016. It was rejected out of hand by a Director. keep up the pressure please. ! Another interesting response on Whatdotheyknow reveals the lengths PHSO go to in order to claim ‘positive feedback’. That 70% satisfaction rate is pure pie in the sky. And they don’t just wait for for people to contact them with positive feedback. No, they target individuals who are likely to provide them with it. The evidence points less to “may choose to notify” and more to “make sure to notify”. What a great analysis of the use and misuse by the PHSO of their heavily selected data. Many thanks Della. As for compliments and thank-yous….during the course of a long and harrowing complaint saga, our statement “Thank you for your reply” was then used to support the claim that we were happy with the content of the reply – which we most certainly weren’t. Now we only ever write “Thank you for sending me your reply”. It’s always shocking to find how words can get twisted in unscrupulous hands. I think Mr Behrens should go back to school and do his Maths GCSE again, with particular reference to statistics and do 100 lines for being a naughty boy “I must not forget to use all the parts of an equation in the equation”. The majority of cases are dismissed without investigation. The cases which move forward are often redefined with many of main concerns heartlessly excised without further examination. In the cases I have knowledge of, no full engagement with complainants take place to understand cases, however simple or complex. The addressing of your complaints about PHSO case handling will be corralled in Customer Care – deferred until after the Final Decision made – a decision which, note, is at present irreversible. The Decision will be based on the advice of ‘cloaked’ Advisers whose identity you will never learn and who bask in the fact they will never come under scrutiny. Few paltry and insulting consolatory payments are made to the ‘lucky’ few whose cases are upheld- paltry set against the years of case preparation. I have evidence that if a slap hand recommendation to review practice at Trusts ensues, no rigorous future monitoring occurs to reassure a complainant that lessons have been taken onboard. A resulting report which though it claims to be robust and accountable, isn’t. You may well note a haughty, condescending approach, with months/years of waiting before you even get the go -ahead signal. Delays provide an excuse for the parties complained of to argue out of time, or loss of records. The cost of Judicial Review puts this beyond reach of those resilient few who have stayed the course, by trying to face up the inhumanity of this system. Few Judicial Reviews ironically suggest a satisfactory system! It is a statistic comforting only to the Ombudsman. Complainants risk the trashing of their character if they continue to argue simply for adherence to an investigative approach. The label ‘vexatious’ can bring about disengagement. Without Della Reynolds, and those few individuals who first founded this group, the commonality of widespread appalling experience at the hands of the Ombudsman’s Office would not have become so starkly apparent. Those who followed behind them in this complaint journey are indebted. The NHS publish a document asking for comments AND Complaints. Why do PHSO not do the same ? Elizabeth, I never thank anybody for a reply. I always acknowledge receipt of a reply.. These guys are expert at twisting words and making inaccurate interpretations. They are after all, highly trained to avoid accountability, like all civil servants. .
Over the past 4 years, I have closely observed how the PHSO operate. I am amazed how they can describe their ‘investigations’ as ‘robust’. Complainant’s points are summarised, in PHSO Final reports, in such a way that any reader would assume they are groundless and have been brought without documentary evidence. They leave the justification for complaint out of the report, thus ensuring any future reader can point to the complainant as a time waster. I know – I’ve witnessed it. Not being believed is demeaning in the extreme and the best deterrent for those looking to ultimately improve care for everyone. New ombudsman same old organisation, approach and misinformation. We are told to expect transparency- when? its been promised since 2009 in my experience and logged in Hansard in the minutes of the Commons Select committee scrutiny of successive PHSO. When is Parliament going to act instead of talk? MP’s know the system is broken so why waste funds on it? Regional and local complaint processing was more effective before HSO was invented in 2010 out of HCC. That’s how long I have been awaiting justice. Without transparency, can we ensure honesty?? Interesting that today a Government Minister announced that nobody could believe what civil servants do. Does this mean that at last Government Ministers are beginning to realise what deceit and lies go on within the civil service. and placed on public record ! If the PHSO give statistics that show they receive positive feed back from service users, whether their cases are upheld or not, then the surveys must be written in a way which means the response can only be a positive one – i.e. ‘Was the member of the customer care team polite’? The service user answers by ticking a box indicating ‘yes’ or ‘no’ with no ‘box’ to elaborate. I can honestly say the members of the customer care team I spoke with were always polite whilst at the same time ignoring my evidence and sound reasoning, I found this infuriating. Jacob Rees Mogg M.P. stated this week that you cannot believe statistics published by civil servants. A brave man speaking the truth ? I am considering contact with he CPS to consider charges for “misconduct in public office” against the Head of the NHs Trust who refused to treat because of my complaint, which he considered was a “break down in the therapeutic. relationship.” .The head of the adult social services at my County Council also lied in his evidence to the PHSO. . I have been suffering for and having treatment for Post Sepsis Syndrome, when I first established it as a serious problem in January 2016 nearly 18 months after discharge .